We live our lives and struggle with consistently figuring out how to negotiating right from wrong. Sometimes revenge feels right, but it is never right. Sometimes having feelings for someone outside of your marriage may feel right, but it too is never right. Even stealing can seem right to a person in certain circumstances. With our lust and enticement from Satan, almost anything can feel right. What is amazing to me is that in the moment we don’t feel anything but vindication and justification. Once we come to ourselves, the only things left to feel are guilt, sorrow and regret. There are even people walking around further punishing themselves because they feel they don’t deserve forgiveness. What makes matters worse is that there are people who will exploit these relationships and seek to control another person because they have a hard time with forgiveness. God sent his son so that we would not ever need to struggle with guilt. God giving his son was meant to be sufficient for anyone struggling with guilt. Jesus became an unlimited credit card for sins and all anyone in the family needs to do is call on him and he will take care of the tab. Some may feel guilty for running up a tab, but all Jesus says is, don’t worry about paying me back, just pay it forward. So we would allow our present experiences to control future experiences. Since I had a huge debt that was paid for me, I would extend in a like fashion this same grace to another. Sounds easy enough doesn’t it? Well, why do we have such a hard time with this? Wouldn’t it be nice to live in a community that understands this principle? Wouldn’t it be nicer to just meet a group of church folks who believe it and consistently practice it? Truth is, this is a personal principle that is up to every Christian to uphold alone. The purpose is for one person to affect another. It’s supposed to be a domino effect. 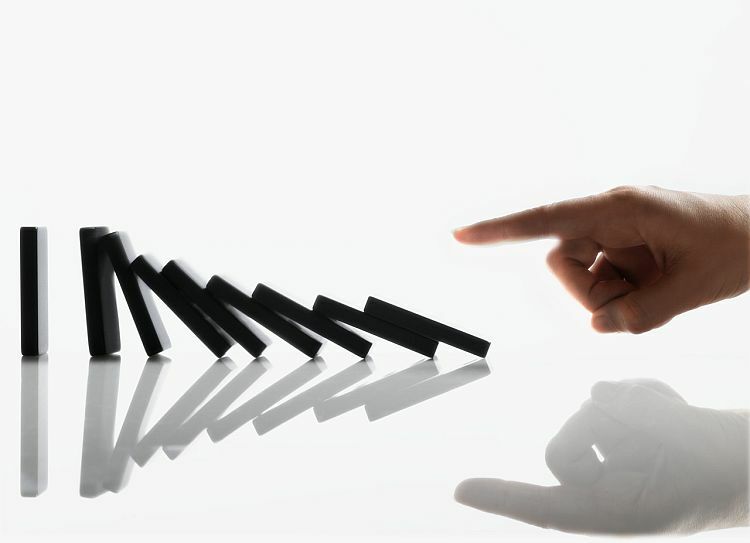 All God needs is for someone to knock down the first domino. Will that be you dear reader? Amen brother, I couldn’t have said it better!!!! Thanks for ALL you do for the work of the kingdom!!! Bye bye guilt. And Amen! Powerful message Brother. The elephant lifted off my chest! Thank-you sir!